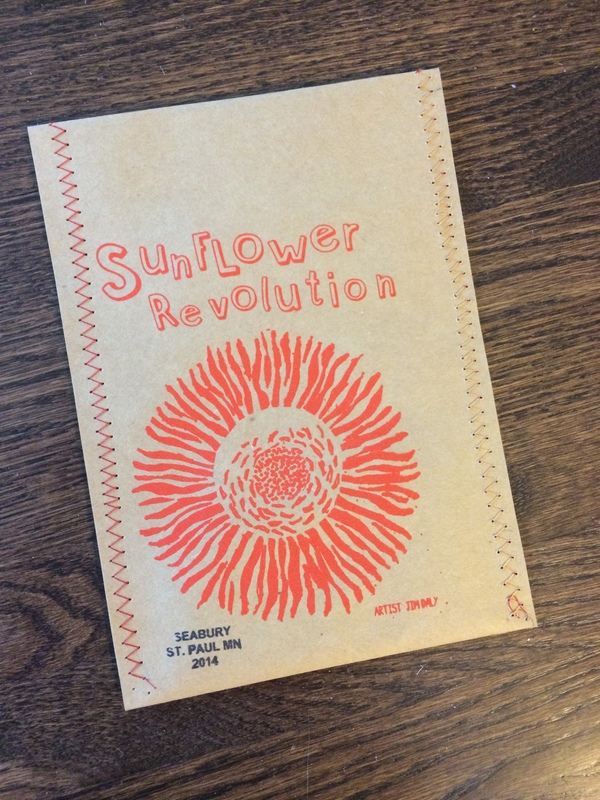 low tech/high joy collaborative, the placemaking team of Minneapolis artists Marlaine Cox and Karen Kasel, is launching the fourth iteration of The Sunflower Revolution, a seed gifting/planting project. For the Revolution, the artists create, fill and seal seed packets to hand out to the public, encouraging people to plant sunflowers as bright harmless graffiti in the urban environment. For 2014 the artists are working in three urban places with a goal of handing out 450 seed packets. Everyone is welcome to join them, get a seed packet and participate in activities. The seeds were purchased from Seed Savers Exchange, a non-profit organization that saves and shares the heirloom seeds of our garden heritage. The center of The Sunflower Revolution 2014 is Seabury, an apartment complex that is part of Episcopal Homes, a senior housing facility on Fairview and University in St. Paul, MN. low tech/high joy, through funding from Irrigate Arts, has been collaborating with the staff and residents of Episcopal Homes in every step of the project; designing the art on the seed packet, selecting the type of seeds, screen printing, filling, sewing and distributing the packets. The seed packet making project culminates with the installation of a Seed Hub in front of Episcopal Homes on University Avenue. The Seed Hub is a box similar to a Little Free Library, where community members can pick up a packet of sunflower seeds. Sunflower seeds will be planted in the beds that bookend the entrance to Episcopal Homes. Saturday May 10, 2-4 rain or shine. 64th & Lyndale Ave. S.
low tech high joy’s Sunflower Revolution will be happening in artist Danny Saathoff’s structure built specifically for the SHORE: RICHFIELD event. Visit the artists in sewing up some seed packets to take home, plant a seed in a newspaper pot, or join the artists for subversive seed planting story time. SHORE: RICHFIELD runs from 12-6 with a variety of performances and arts activities. The Eco Arts Fest is a great family event, with a variety of hands-on art activities, dance, music and a parade. low tech/high joy will set up a cozy spot nestled between oak trees where visitors can sew, fill, stamp and seal seed packets to take home. Other activities include story time, with the artists reading books such as “Miss Rumphius”, a story about a woman who scatters lupine seeds everywhere, making the world a more beautiful place. During the day, Chicks on Sticks will be stilting and directing people to locations where they can plant sunflower seeds on Harriet Island, along the Mississippi River, a major fly-way for migrating insects and birds.